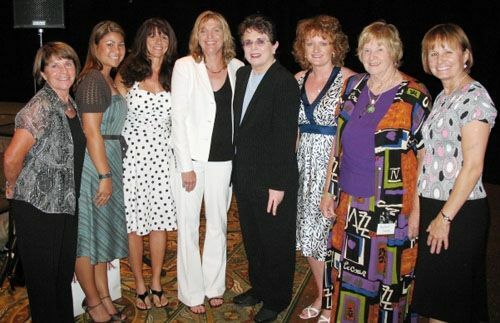 Our thanks go out to Phoenix Women’s Sports Association (PWSA) for featuring tennis legend Billie Jean King as the keynote speaker at their Fourth Annual Girls and Women in Sports Awards Dinner on Saturday May 19, 2007. The PWSA Awards Dinner recognizes outstanding Arizona female athletes and coaches at the high school, community college and university levels, as well as the community and corporate leaders who support them and outstanding journalists who cover girls’ and women’s sports. After the event, Billie Jean generously took time out to talk to USTA Section Staff and Central Arizona volunteers who attend this celebration of women in sports. Billie Jean’s message was to make it easy for people to learn and play tennis, especially the kids. With a focus on fun, team and the social aspect of the game, she is confident we can grow the game of tennis in Arizona. Also attending the evening as part of the PWSA’s parade of elite athletes was Anne Smith winner of 10 grand slam doubles championships. During 1980 and 1981, Anne held the world number one doubles ranking winning the French Open and Wimbledon doubles titles in ’80 and the US Open and Australian Open doubles championships in ’81. Joining our table of staff and volunteers for dinner, Anne graciously shared her tennis experiences. As a valley resident, PhD psychologist, Motivational Speaker, and Mental Training Consultant, Anne also provided her thoughts and insights about tennis in the greater Phoenix Area. To learn more about Anne and her career past and present go to http://www.annesmithtennis.com.